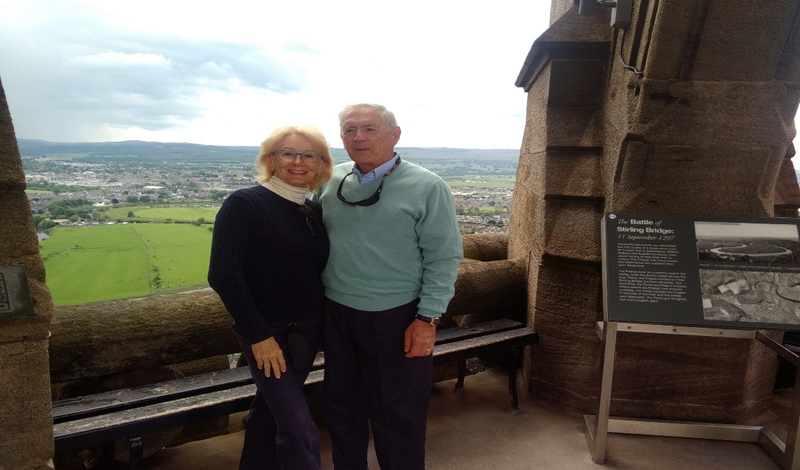 Thank you to our guests BJ and Allan Blair for their wonderful words and photos of their trip to Britain and Ireland. It took a while to figure out the what, where, and when in setting up this trip. London was revisited after many years to enjoy a few days spent with friends. 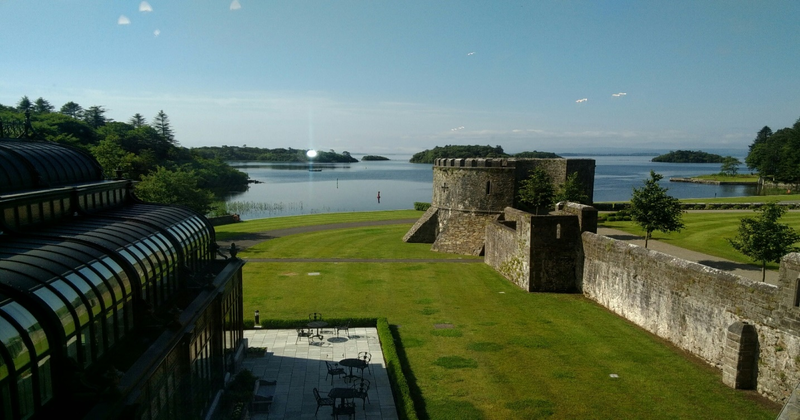 So many of the areas of Scotland and Ireland are filled with long and interesting histories that demand in-depth study to understand the politics, the people, the transitions, and of course, their intertwined past and diverse cultures. Below are our notes of what happened on our trip this year, the places we visited, and the reasons for choosing the locations we visited. Thanks to Sheenco Travel, located in Ireland, their personnel, and our drivers in Scotland and Ireland who made it a banner holiday! 5/29 On a rainy morning, we caught the shuttle that spirited us to JFK. Fortunately, the departure area had an overhang so we stayed dry and set up for the British Air flight to Heathrow. The flight was uneventful; we dozed, read and watched movies to pass the time and arrived at 7:45 PM. After baggage and clearing customs, we met our friends who flew in from Boston. The company-provided driver was waiting and once again, we were shortly in the heart of London. 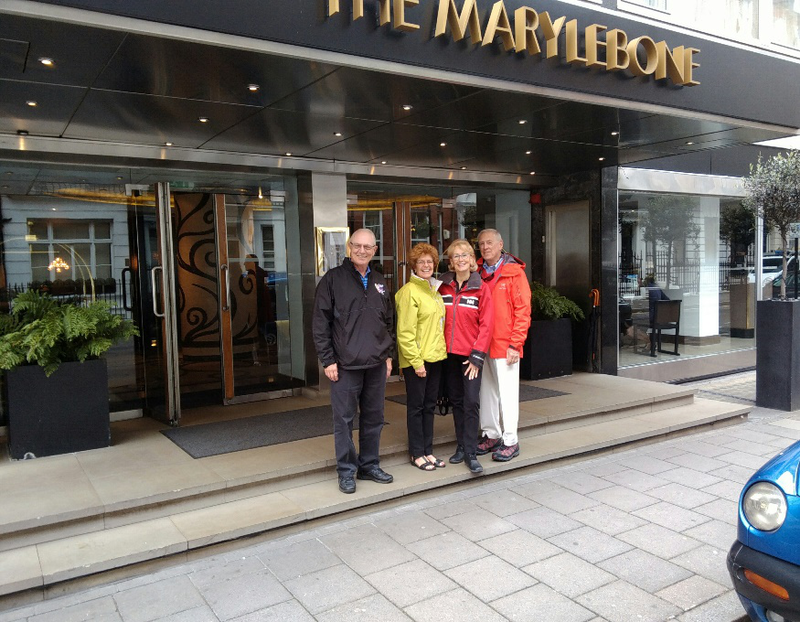 Our hotel, the Marylebone is in a quiet but highly fashionable area where we stayed three nights. Upon arrival, we checked in, dropped our bags in our rooms, and the four of us repaired to their 108 Brasserie, had a light dinner, and planned the next few days activities. In my research, I found that we could cover the most ground in the most efficient manner by using the hop-on/hop-off double-decker buses. We retired and sleep came easily. 5/30 We breakfasted and readied for our first day of touring. I had already purchased the four, two-day bus tickets so we just walked to the stop. Our tour guide was Alfie who had a great sense of humor and a wonderful knowledge of the sights and areas we visited. There were several colored routes one can take, some cover the same and others cover different parts of the City. We started with the yellow route. Marble Arch-designed by John Nash in 1827, a 19th century, white marble arch with three openings. It was moved from its original location due to the need by Queen Victoria for more space at Buckingham Palace. Historically, only members of the Royal Family, the King’s Troop, and the Royal Horse Artillery are permitted to pass through the arch and this only happens in ceremonial processions. We passed through the Hyde Park area, the largest of the four royal parks. Established by Henry Vlll in 1536 when he took the land from Westminster Abbey and used it as a hunting ground. Here is found Speaker’s Corner, established in 1872 and the “free” speeches are sometimes hilarious and sometimes quite sad. Buckingham Palace–originally known as Buckingham House was owned by the Duke of Buckingham. Purchased in 1761 by King George lll for Queen Charlotte, it became known as the “Queen’s House.” It was enlarged by Queen Victoria and became her London home in 1837. It is the central point for the British people to congregate at times of national rejoicing or mourning. Westminster Abbey-since the 1066 coronation of William the Conqueror, this has been the site of all British coronations and almost all their weddings. It has the status of a Church of England “Royal Peculiar” or a church responsible directly to the reigning sovereign. Big Ben-the nickname for the great bell of the clock at the north end of the Palace of Westminster (both clock and tower). Originally, the Clock Tower, it is now named the Elizabeth Tower, since 2012, the Diamond Jubilee of Elizabeth ll. London Eye–a giant Ferris wheel on the south bank of the River Thames is 443 feet tall and has a diameter of 394 feet. Originally, the tallest in the world. IMAX-interesting building at night due to its lighting. Shakespeare’s Globe Theatre-built in 1599 by Shakespeare’s playing company and rebuilt after a fire in 1613. Today’s building is a modern reconstruction and opened in 1997 with the production of Henry V. The new theatre is 750 feet from the original site. The Tower of London-a royal residence until the 17th century, it has been used as a prison, menagerie, and a place of execution. It receives up to 3,000,000 visitors each year and the Crown Jewels are a large attraction. Tower Bridge-built between 1886 and 1894, it crosses the River Thames and is an iconic symbol of London. St. Paul’s Cathedral is an Anglican cathedral, and the seat of the Bishop of London, and it sits at the highest point in London. The Dome was purposely built to be seen around London after the Great Fire of London. The present cathedral dates from the late seventeenth century but the original building on the site dates from 604. This is a working church and the tourist entry fee is 18 pounds for adults and no charge for worshippers. Services for some very famous Britons have been held here. Royal Courts of Justice-houses the High Court and the Court of Appeals for England and Wales. Designed by Street and built in the 1870’s. The “old bailey” is situated approximately one-half mile from this location. Statue of Eros-a winged archer poised with his bow. River Thames-it is 215 miles long, has 45 locks, 38 tributaries, and contains 80 islands. It is made up of fresh and brackish waters. We then walked back to our hotel, cleaned up and set off for lunch. We met in the lobby and walked the 3.5 miles to view the fabulous displays of ancient Egypt at the British Museum-has a permanent collection of some 8,000,000 works. Established in 1753 by order of Parliament during the reign of King George ll, and opened in 1759 in Montagu House, on the site of the current building. Based upon the colonialization and exploration of the British, there are exhibits from around the world. The beginning of the collection was bequeathed by Sir Hans Sloane, an Irish born physician and naturalist. This museum is where the Rosetta Stone is housed. It was found in 1799 in Egypt and was the key to deciphering Egyptian hieroglyphs. This is a must see on your tour of London. We returned to our hotel, cleaned up and set off for an early dinner at the Ivey Café. It was a talky place with good food. We then headed back to our hotel and realized that we had walked eight miles that day. 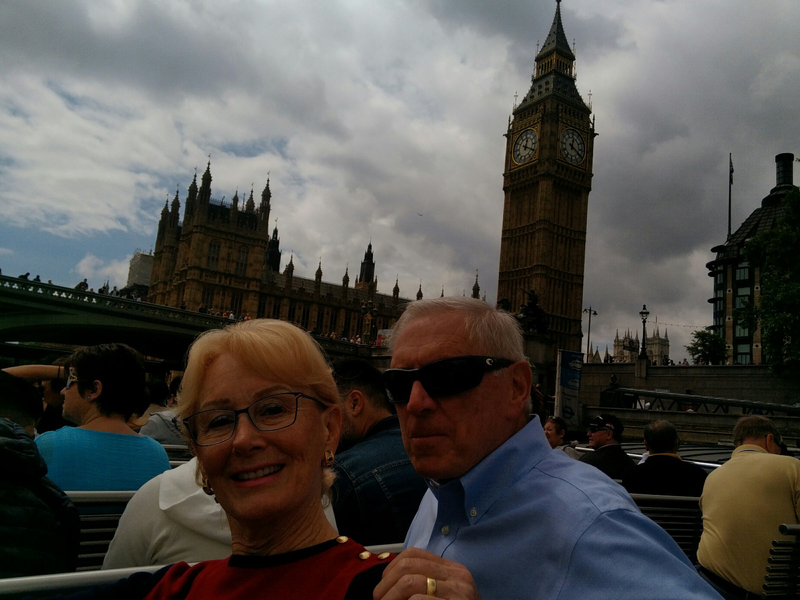 5/31 We had a full breakfast at 7:30, met in the lobby, and caught a cab for a tour of the river. Many of yesterday’s same sights were evident. We passed the: H.M.S. Belfast, a light cruiser that was built in 1936 and launched in 1938. Originally used as a blockade ship, she struck a mine in 1939 and spent two years being refitted. In 1942, she returned to action escorting Arctic convoys to the Soviet Union. She was part of Operation Overlord and the Normandy Landings. She was active in the Korean War and entered the reserve fleet in 1963. In 1971, she was transferred to a Trust. Since 1978, she is a branch of the Imperial War Museum. London and Westminster are directly across the river from each other. London proper is only one square mile. The river cruise afforded a fabulous view of the skyline.We had hoped to view the Crown Jewels. 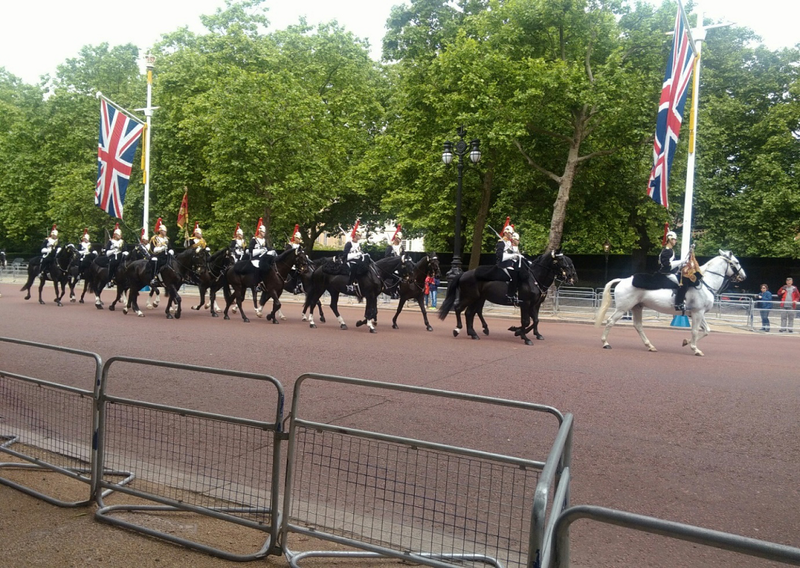 Arriving, we found the line too long!While walking around Buckingham Palace, we discovered that the London House Guards were practicing for Queen Elizabeth’s 90th birthday celebration (which became famous for her parachuting out of a helicopter with “James Bond”). It was a fun spectacle and our front row seats would have been impossible on her birthday. After an eventful day, we walked back to the hotel and relaxed. We were having dinner with friends of our traveling companions. The couple took a British Rail down the 1.5 hours to join us. He is originally from Scotland and a transplant to England. It turns out that he is an accomplished sailor and regaled us with sailing stories and times at IBM with our friends’ many years ago. This day, we logged 7 miles and the walk home was followed by a quick trip to sleep. 6/1 We arose early to finish packing, have breakfast, and take a taxi to the British Rail station for our trip to Edinburgh, Scotland. The 4.5-hour train ride was through a very lovely countryside.We then cabbed it to our historic hotel, The Caledonian (The Ritz). 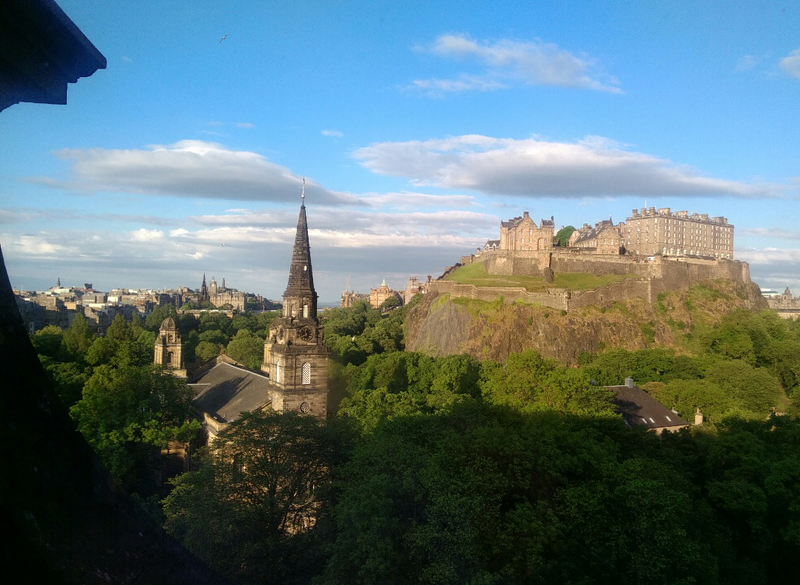 We spent two nights in a lovely suite with the above magnificent views of Edinburgh Castle.After unpacking, we walked over to the Grass Market area below the castle. There, we found many young people, many pubs, and lots of varied retailers. We stopped in for a drink at The Last Drop and then returned to the hotel. We passed on dinner based upon the size of each morning’s breakfasts! We read, watched TV, and retired at 9 PM. 6/2 We awoke at 6 AM and went down to breakfast. We readied for another hop-on/hop-off bus tour of the City of Edinburgh. We continued to enjoy the terrific view of the Castle from our room. 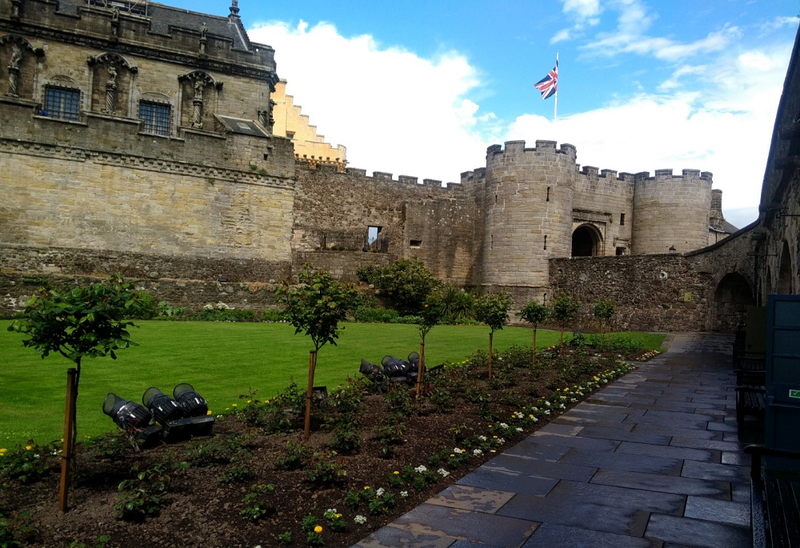 Our bus tour started with a viewing of:Edinburgh Castle-a historic fortress that dominates the skyline from its position on the Castle Rock. This castle was occupied from the 12th century and a royal residence until 1633. Its role then changed and it was used as a military barracks. It has had 26 sieges in its 1,100-year-old history. The use at present is ceremonial. Scottish National Portrait Gallery-an art museum and gallery that holds collections of portraits and photography. It has approximately 3,000 paintings and sculptures, 25,000 prints and drawings, and 38,000 photographs. Holyroodhouse Palace-built between 1671-1678 and the official residence of the British monarch, presently Elizabeth ll. Located at the bottom of the Royal Mile at the opposite end to Edinburgh Castle. It has served as the official residence of kings and queens of Scotland since the 16th century.Scottish Parliament-comprised of 129 MSP’s who are elected for a four-year term. It seems to me that the Scottish Parliament is somewhat subservient to the English Parliament that sits in Westminster, England and has the right to by amend laws! ?Kirk of the Canongate-the congregation of the Church of Scotland. It includes the parish of Holyroodhouse, Edinburgh Castle, and the Scottish Parliament. It was founded in 1681 and finished in 1691. Museum of Edinburgh-one can view through film and displays, the history of Edinburgh. Museum of Childhood-a collection of toys and playthings and situated on the Royal Mile. 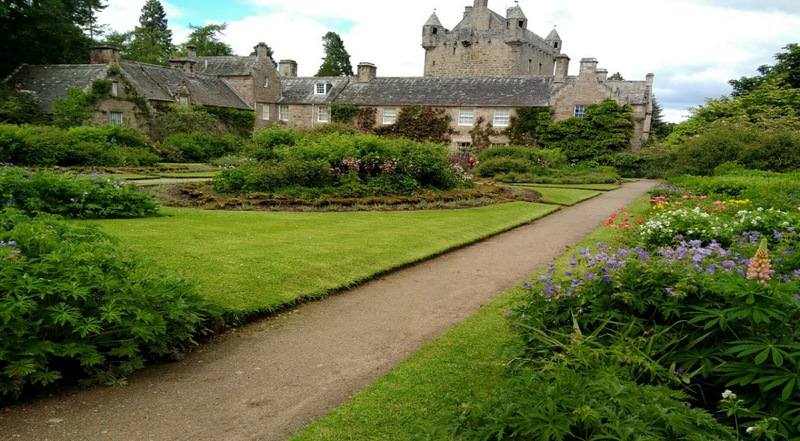 Exhibits range from the 18th to the 21st century.George Heriot’s School-has over 1,600 students, 155 teaching staff, and 80 non-teaching staff. An independent primary and secondary school in Old Town that was opened in 1659.We visited the “Scotch Experience” and several stores that sold cashmere scarfs, gloves, and kilts, Harris tweed jackets, etc. We then walked back to our hotel through “Old Town” for lunch. The stone buildings were very solidly built. 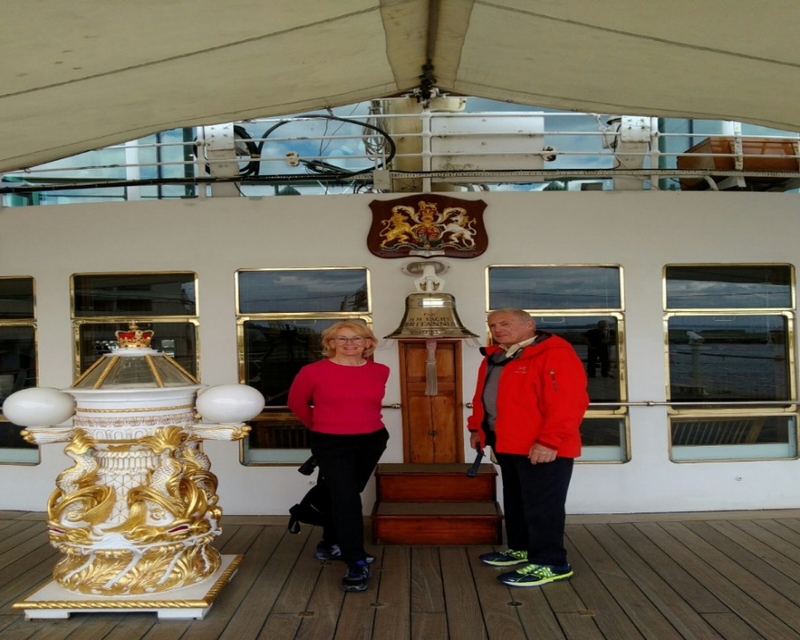 Our tour of the Yacht Britannia was fascinating. In the 50’s, it must have been spectacular. Allan appreciated the fact that they had a garage for their Rolls Royce so they could motor in style on their land visits. BJ marveled at the staffed laundry/dry cleaning facilities while yachting. Later in the day, we repaired to Peacock Alley, the hotel’s bar/tea room, for a light snack. Reading to pass the time, we wound up the evening with an early turn-in. 6/3 Awakening at our usual early hour, we lounged in bed since our driver/guide was not due until 10 AM. After another breakfast with too many delicious choices, we packed and checked out while Maurice stowed out bags. As promised, his vehicle was a brand-new Mercedes. Our first stop was Stirling:The Wallace Monument-a tower that stands on the summit of Abbey Craig. It commemorates Sir William Wallace, a 13th century Scottish hero. The sandstone tower is 220 feet tall and built in the Victorian style. Wallace is known for his defeat of the English forces at the battle of Stirling Bridge in 1297. In the end, he was captured, handed over to King Edward l of England who had him hanged, drawn, and quartered for high treason. We walked up the 246 steps to top of the monument. For those not in good shape, you are out of luck. The views of the surrounding countryside from the top spire are spectacular. We then drove to: Stirling Castle-surrounded on three sides by steep cliffs, it was easily defended at that time. Most of its buildings date from the 15th and 16th centuries. A few structures are from the 14th century while the defenses fronting the town date from the early 18th century. Mary, Queen of Scots, daughter of Mary of Guise (2nd wife of James V) was crowned here in 1542. The castle went through eight sieges, the last, unsuccessful, by Bonnie Prince Charlie in 1746. It is now managed by Stirling District Tourism, Ltd. We found it interesting to see how James lived and ruled Scotland. Next was the drive to and around Glasgow where we stayed at the Carlton George for one night. Located in the heart of the “action.” Our room was very Scottish with serious plaids. We had dinner at a very good Thai restaurant. After dinner, we walked to Glasgow Cathedral-a fabulous structure and known as the High Kirk of Glasgow. They were setting up to have an orchestra performance that evening. The lady in charge let us in to see the interior since we could not stay due to the performance starting too late and our needing to be up early the next morning. Built on the site of the patron saint of Glasgow, St. Mungo. His tomb lies in the lower crypt. Built from the 12th century on and one of the few Scottish, medieval churches on the mainland to have survived not being unroofed. It is now not technically a cathedral since it is not currently the seat of a bishop since 1690. We took a cab back to our hotel, brought a book down to the bar/restaurant and partook of complimentary snack food and drinks. The People’s Palace. It has a beautiful terra cotta fountain that was donated by the Dalton Co. and a glass conservatory. The building had more socialist propaganda than we found in China or Russia. Our guide then drove us through some fabulous scenery with the many shades of green to be seen in Scotland. By taking a detour, we viewed a home that once belonged to Ian Fleming. They lived there for fourteen years. It is now fenced due to the lack of privacy and curious tourists. 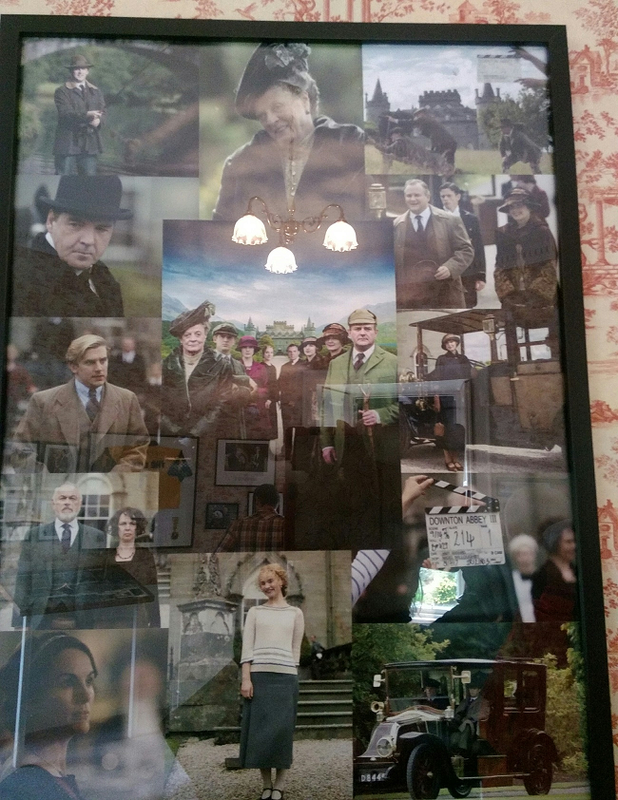 It was a rather large estate and the James Bond movie, “Skyfall” was partially filmed there. Also filmed was a Harry Potter scene where they were flying around on their broomsticks. Next, we had lunch at a great local restaurant, the Loch Fyne Oyster House. 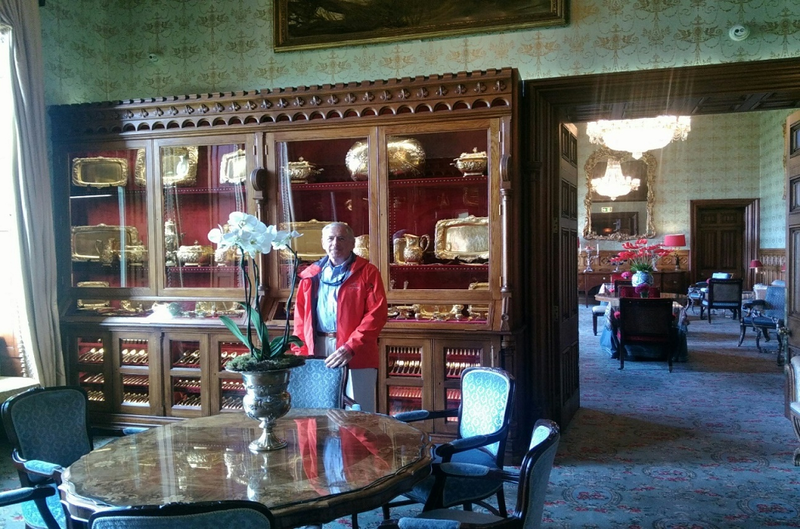 After lunch, our driver took us to Inveraray Castle which was not on our itinerary. The breathtaking armory hall is considered one of the most magnificent rooms you will find anywhere. It rises almost 70 feet (the full height of the castle) to the ornate ceiling and every wall is covered by displays of muskets, swords, pikes and bayonets. These ancestors could field an army said to be stronger than the armies of either England or France. However, the 5th Earl’s influence declined after he commanded Mary Queen of Scots’ losing army at the Battle of Langside in 1568. However, the 9th Duke in 1900 married Princess Louise, daughter of Queen Victoria. And the current Duke is married to a Cadbury (yes, chocolate). 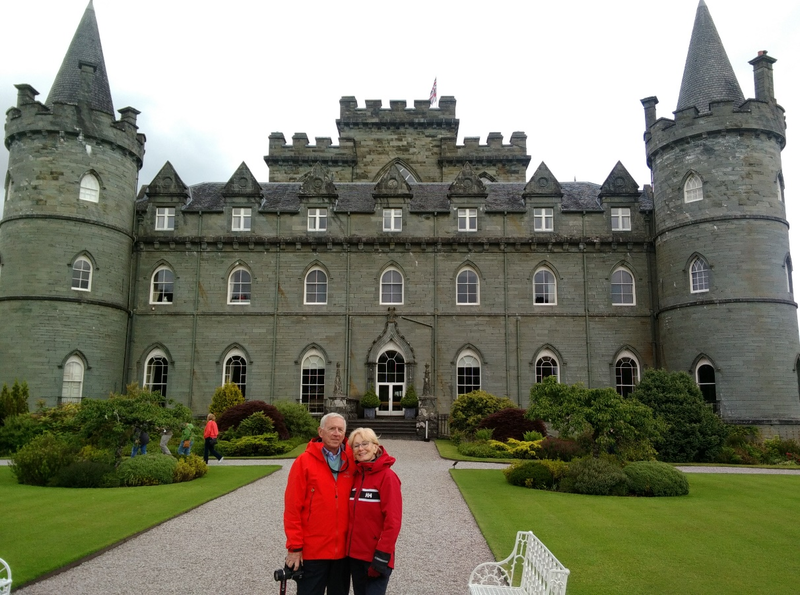 We made our way to Ft. William and the Inverlochy Castle for a 2-night stay. Our suite of four rooms in this Chateau et Relais hotel was well worth the stay. Their hotel transport is a Rolls Royce. We passed on dinner since lunch was such a grand affair. We retired early because Maurice was picking us up at 9am. Eilean Donan Castle-a picturesque castle seen in many photos, film, and television. 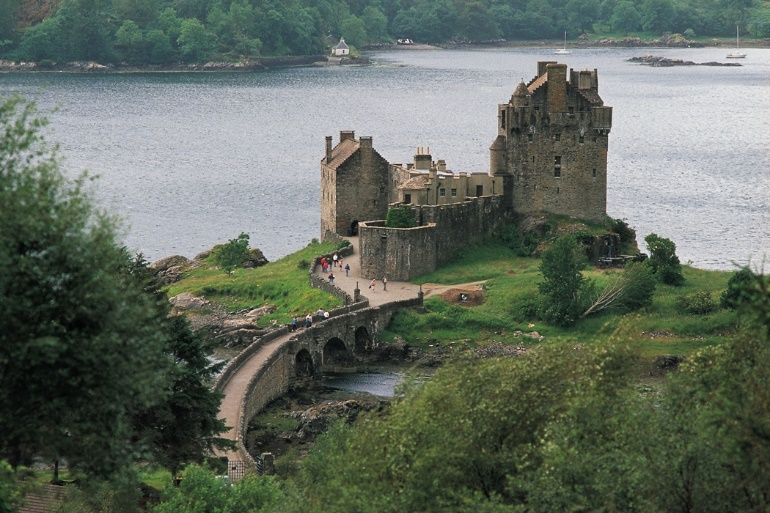 It was founded in the 13th century and became a stronghold of the Clan Mackenzie and their allies, Clan Macrae. In 1719, the castle was destroyed by English ships for the Mackenzie’s involvement in the Jacobite Rebellion (these risings were due to the highlanders staying Roman Catholic while the crown tried to establish Presbyterianism as the dominant religion in Scotland and the locals wishing a restoration of a Stuart Monarchy under the exiled, James Stuart). The castle underwent restoration in the early twentieth century. A footbridge connects the 1-kilometer distance from the village of Dornie. This is one of forty scenic areas of Scotland. We then traveled to Armadale and boarded a car ferry to Mallaig where we set off to Glen Finnan. These locations are in the highlands. The three of us had dinner at Brown’s. After dinner, we were dropped off at our hotel where BJ watched Teresa May, the present Prime Minister, on TV, who is being severely tested with the terrorist attacks, fire in low-income housing with no fire alarm, and Brexit. Urquhart Castle-Sitting beside Loch Ness, it is now a ruin. It was built on an early medieval fortification in the 13th century. It played a role in the Wars of Scottish Independence in the 14th century (the wars between the kingdom of Scotland and the kingdom of England). Partially destroyed in 1692 to prevent its use by Jacobite forces, it is today one of the most visited castles in Scotland and under the care of the State. They have an 8-minute film that is worth watching and gives the history up to its destruction. Loch Ness-we drove to the exhibit at the visitor center and found that the loch is the deepest lake yet no “Nessie,” the sea monster. 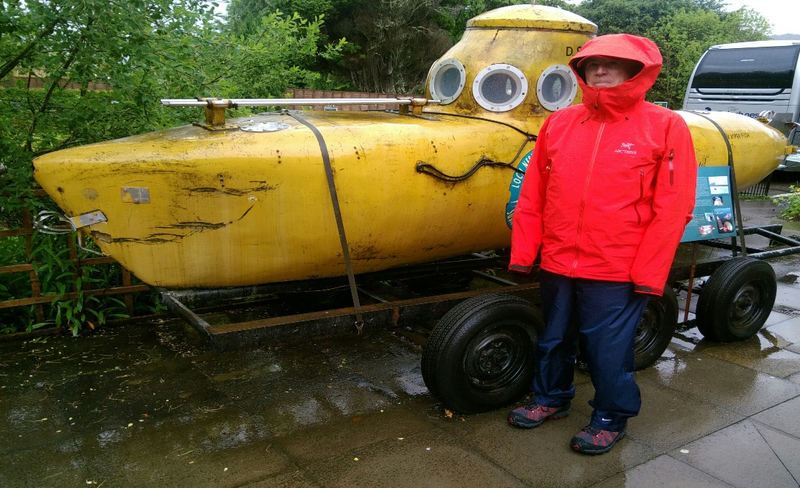 As a mystery which created a lot of tourism, many methods (including a submarine) were devised to discover the “Loch Ness Monster!” We then drove to the hotel since the continued rain was putting a damper on outside trekking. The Drumossie Hotel was a stay of two days. They served strong coffee with hot milk. The Battle of Culloden Moor-the final battle (over in one hour) of the Jacobite rising of 1745 and was a part of the religious/civil war with England. On April 16, 1746, the forces of Charles E. Stuart were decisively defeated near Inverness in the Scottish Highlands by loyalist troops under the command of William Augustus, Duke of Cumberland. This was near Inverness in the Scottish Highlands. This squarely put the Hanoverian line on the throne. This battle was basically Catholics and Episcopalians against Protestants. In the end, Bonnie Prince Charlie returned to France. 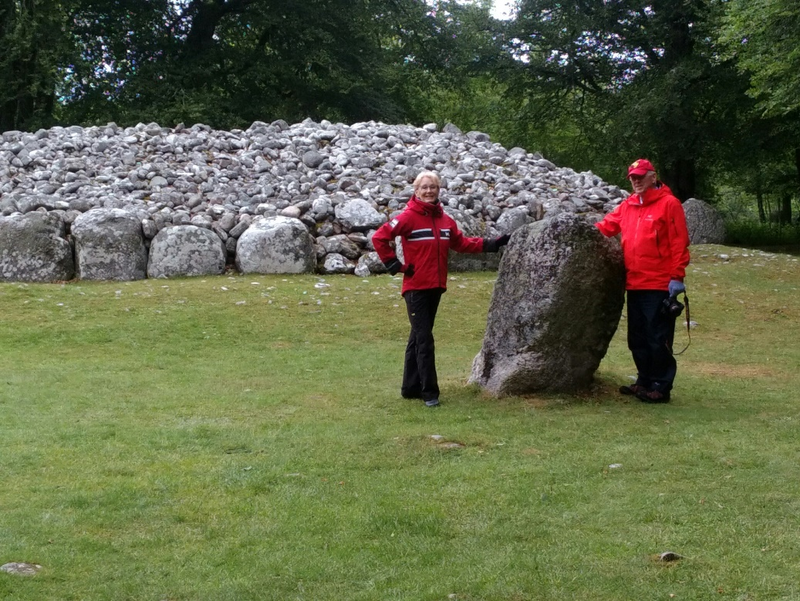 Balnuaran of Clava-stones that were arranged some 4,000 years ago and set as a cairn (stack of stones) for purposes of burial. One cairn is closed and one is open and the interior can be viewed. We then drove to Ft. George, a working barracks for the Black Watch. After this last site of the day, we returned to Innesbrook and had dinner at a very good Indian restaurant called Rajah. The evening ended with our reading. 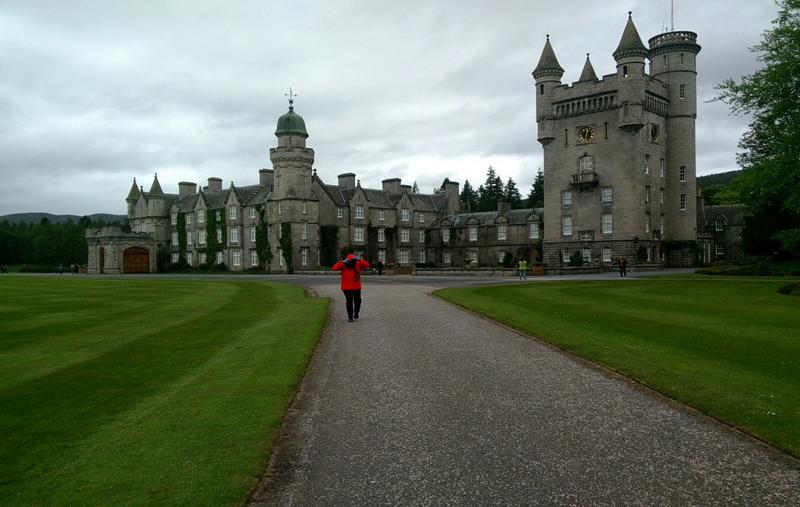 Balmoral Castle-a large estate home in the village of Crathie. Since 1852, it has been one of the Scottish residences of the British Royal Family. This privately-owned home was purchased by Prince Albert, consort to Queen Victoria. 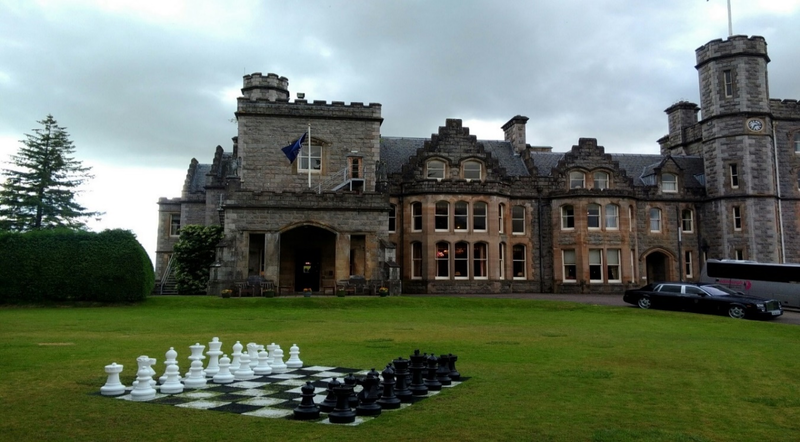 The castle is Scots Baronial style and has had many additions. The old castle was demolished and the new castle erected in 1856. It is now approximately 50,000 acres and a working estate. Once again, the rain is dogging us! 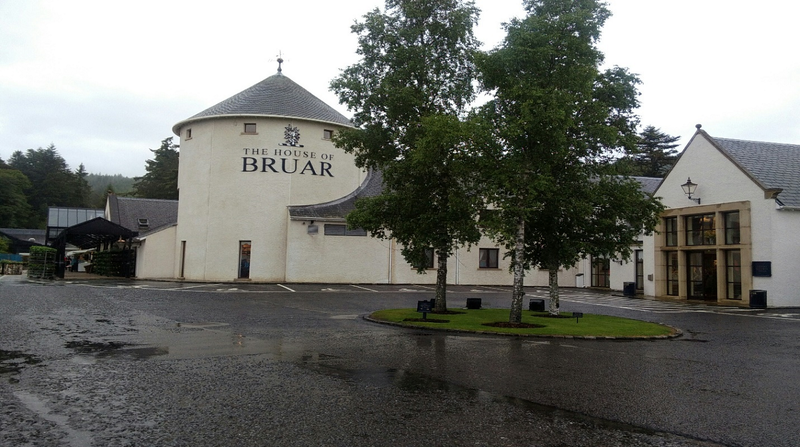 There was a wonderful store or “stores” under the name of the House of Bruar and worth a visit. BJ found the shopping extremely successful. A good time was had by all. Getting there was a rather circuitous route. There were many sheep and much green on the way. 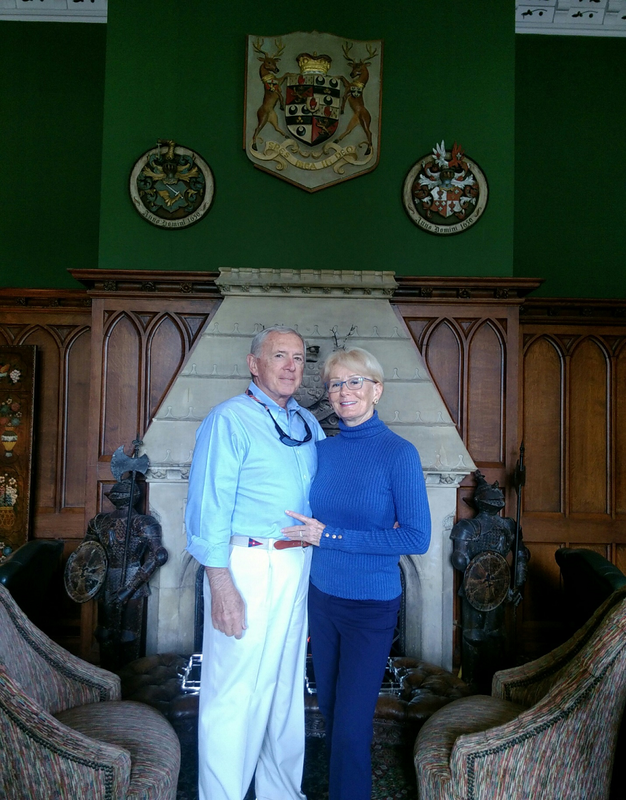 We finally arrived at Fonab Castle in Pitlochry for a one-night stay. Our room was small but excellently appointed. The views were beautiful! Service at dinner was slow yet the food was good. We retired to our room after dinner to continue our research, and note taking. 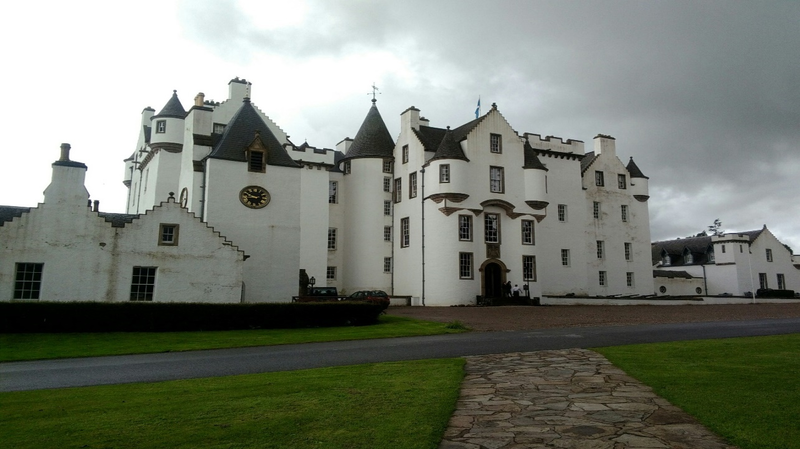 The ancestral home of the Clan Murray and located near the village of Blair Athol. The current Duke (# 12) now lives in South Africa. 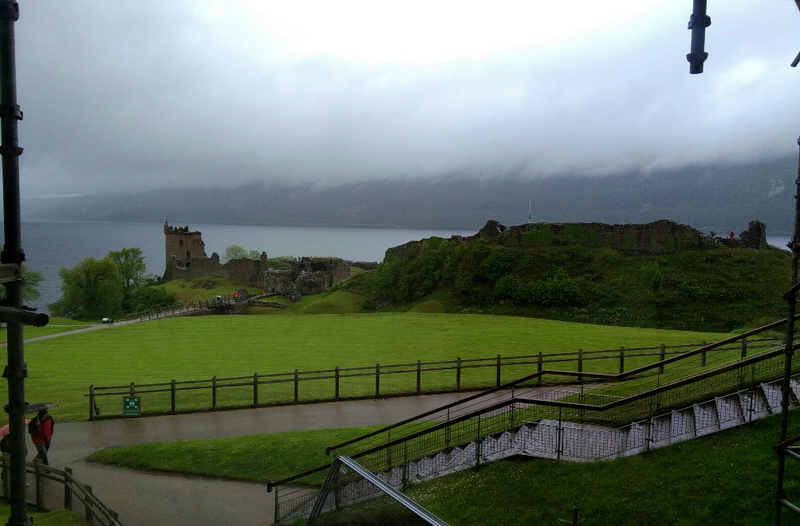 The castle commands a strategic view of the Scottish Highlands. Started in 1269, it has been back and forth between many factions until it was finally placed in a charitable trust in 1996 by the 10th Duke since the 11th Duke, living in South Africa had no desire to return. It has been open to the public since 1936. 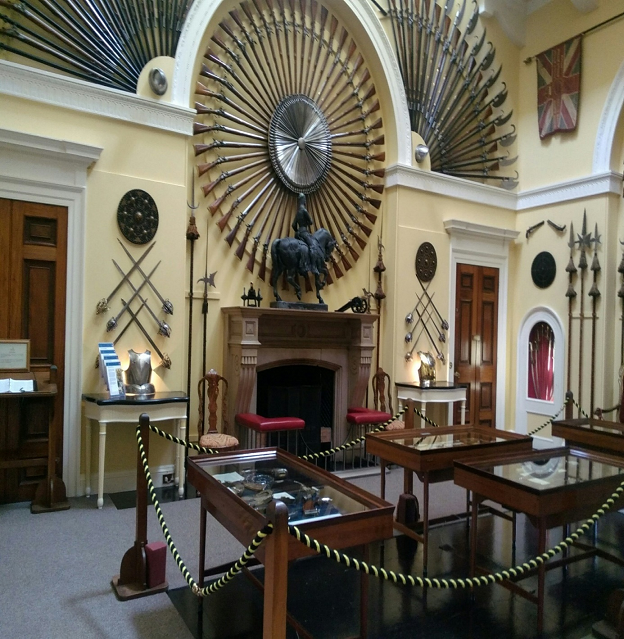 The collections of weapons, hunting trophies, souvenirs of the Murray Clan, paintings, furniture, etc. are a wonderful collection that are worth viewing! The Hercules Gardens that are named after a statue of Hercules on the grounds are also worth the time. 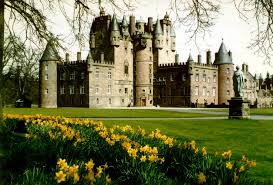 Glamis Castle (above)-situated beside the village of Glamis. 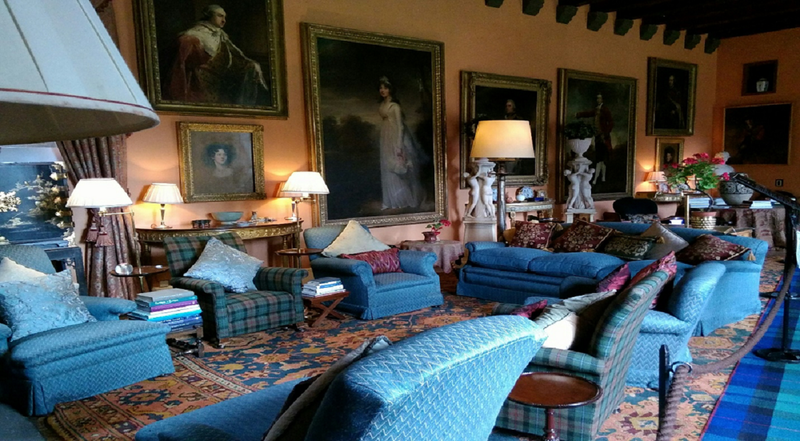 It is the home of the Earl and Countess of Strathmore and Kinghome and open to the public. The present Queen of England’s mother, “the Queen Mum” grew up here and it is one of the most beautiful castles we have viewed. This has been the ancestral home of the Lyon family since the 14th century although the present building dates from the 17th century. It is a working estate that is set on 14,000 acres. The title of Lord Glamis was created in 1445 for Sir Patrick Lyon. The 9th Lord was made the Earl of Kinghome in 1606. In 2016, the 19th Earl became the owner. This castle has a tale of vampires, ghosts, and the true story of the Ogilvie’s who were bricked up and starved to death. 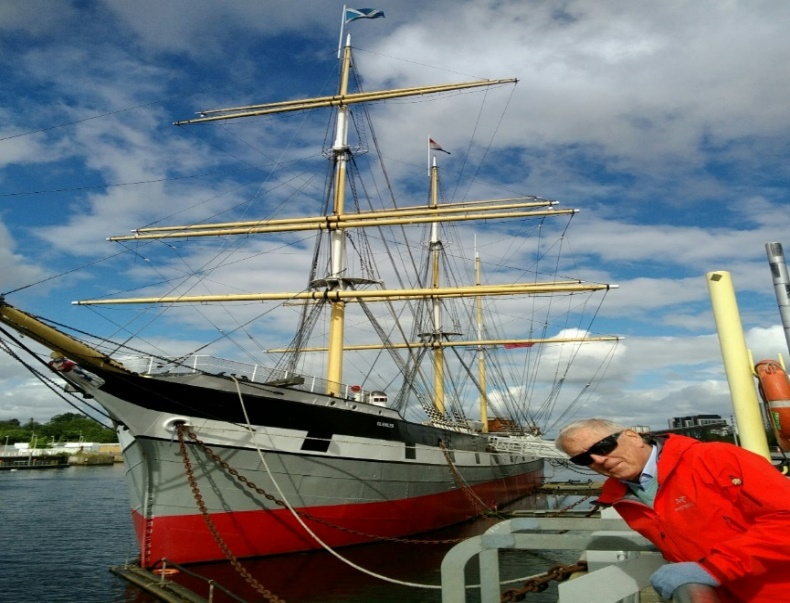 Discovery-we were next off to Dundee to see the ship of the Discovery Expedition (1901-4) that was led by Captain Robert Falcon Scott. This was the last traditional wooden three-master built in Britain. The ship was of wood because they did not want a steel-hulled ship that would interfere with their magnetic readings. There was also the ease of repairing wood. The vessel depended on her sails for power even though she had a 450 HP coal-fired steam engine. Ernest Shackleton was part of this crew and later famous in his own right. The exploration and scientific discoveries of the Antarctic were many in the fields of: biology, zoology, geology, meteorology, and magnetism. Some of their other discoveries were: The Polar Plateau (location of the South Pole), and the Cape Crozier Emperor Penguin colony. We then decided to drive to our hotel, Russacks, in St. Andrews for a 1-night stay and a light supper. I read and BJ watched TV. Our suite, the Bobby Jones had a bedroom, bath, entry, and living room. 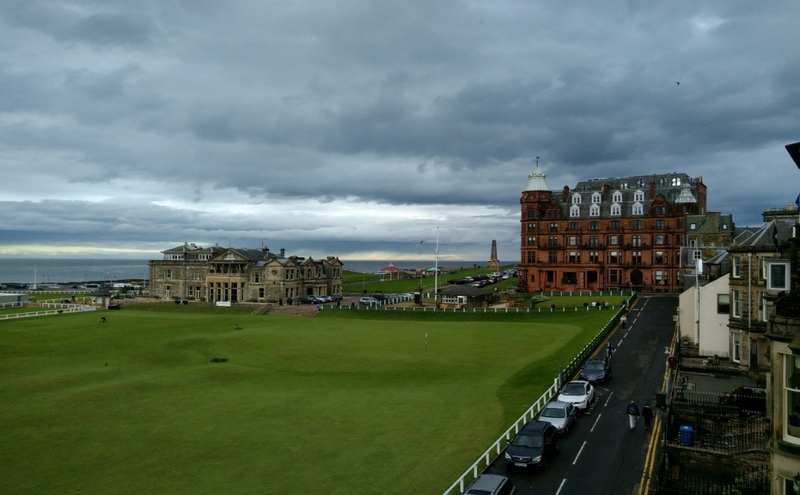 The large windows looked directly onto the fairway of the “Old Course,” and a long run of the beach beyond. 6/10 I stayed in bed until 7 AM. BJ was up earlier and watched the golfers tee off on # 1. After breakfast, we went for a long walk up North Street and down South Street. 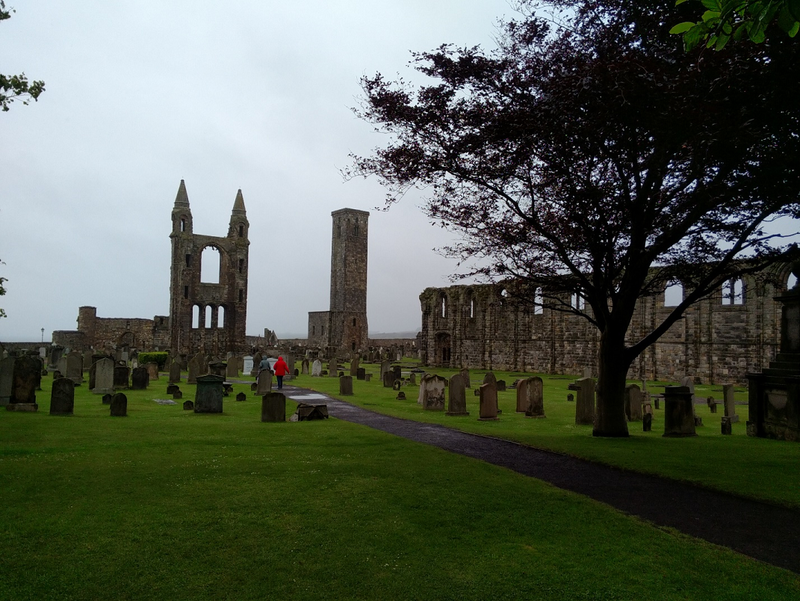 On the way, we visited St. Andrews, and noticed a Scottish Protestant church with its distinctive blue door. We returned thoroughly wet. Thank goodness for rain gear. We finished packing and went downstairs to await Maurice. We are making our way back to Edinburgh and our last time spent in Scotland. We are staying at the Rutland Hotel for one night. Tomorrow, we fly into Dublin. 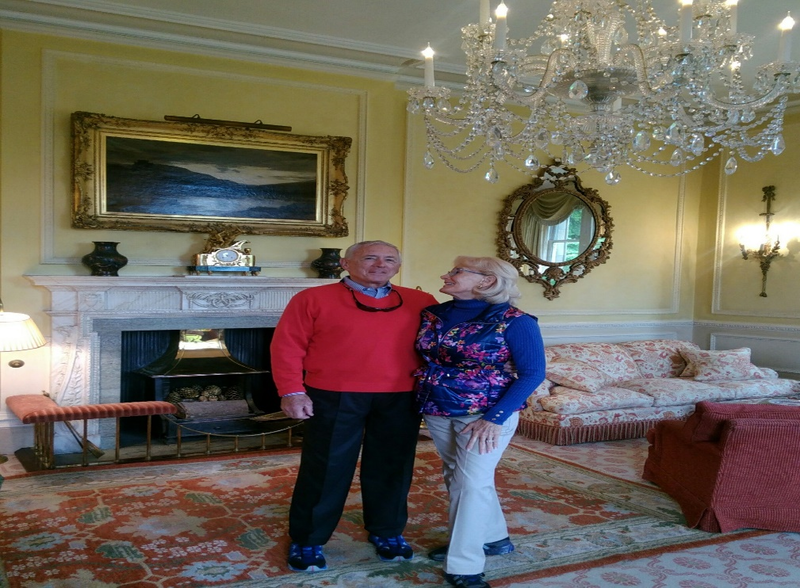 Once in Edinburgh, we bid good-bye to Maurice and a wonderful tour of Scotland, checked into our hotel, and came down to their steakhouse for a late lunch. We then decided to walk over to the “Grass Market Area.” After an ice cream cone, we returned to our hotel to read and watch TV. Our wakeup the next morning came at 5:30 AM. Guinness Storehouse-Being a Sunday, the place was mobbed. It had seven floors of history, a huge bar, and a large store. All attendees were given a free beer or soda. The seventh floor is all windows and the bar. There were mostly young people in attendance. Having skipped lunch, we decided to walk back to our hotel and an early dinner. After so much walking, we decided to hail a cab. He gave us a mini-tour of Dublin and a great recommendation for a restaurant for dinner, FX Buckley. After dinner, we caught a cab back to our hotel. Our usual nighttime activity was reading and TV. Book of Kells- a beautiful, color illustrated manuscript in Latin that contains the four Gospels of the New Testament together with various prefatory texts and tables. Created in the Columban Monastery around 800 AD. 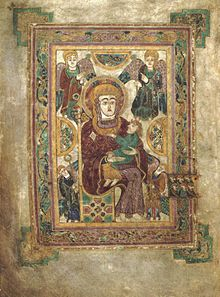 A masterwork of Western calligraphy and insular art (style of art produced in the post-Roman history of Ireland and Britain and originates from the Irish monastic movement of Celtic Christianity. National Gallery-houses the national collection of Irish and European art and is in the center of Dublin. Dublin Castle-the seat of power for the British and now a major Irish government complex. After 1921 and the signing of the Anglo-Irish Treaty, it was handed over to Michael Collins (a soldier, politician, revolutionary leader who was ambushed and killed in August 1922 during the Irish Civil War). 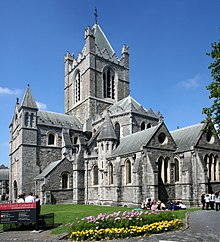 Christ Church Cathedral-elder of the two medieval cathedrals in Dublin and seat of the Archbishop of Dublin. Parnell Monument, James Joyce Statue, Oscar Wilde Memorial were part of the route and in the Georgian area where buildings are in the Palladian style and during the reigns of the four Georges. This style was prior to the Victorian era of building. Also, the Royal Hospital, Wellington Monument, Collins Barracks, Garda Station, and the Temple Bar. St. Stephens Green-opened in 1880 as a public park and adjacent to one of Dublin’s main shopping area. It is rectangular and twenty-two acres. St. Patrick’s Cathedral-founded in 1191, it is the National Cathedral of the Church of Ireland. It is the largest and tallest church in Ireland. Since 1870, the Church of Ireland has designated St. Patrick’s as the national cathedral for the whole of Ireland. The dean is the ordinary for the cathedral and its most famous office holder was Jonathan Swift. We then had lunch in a small, French cafeteria. On our way back to our hotel, we stopped into the local markets. At 7 PM, we went down to the bar in our hotel for a light supper, followed by our regular pattern of BJ watching TV while I read. 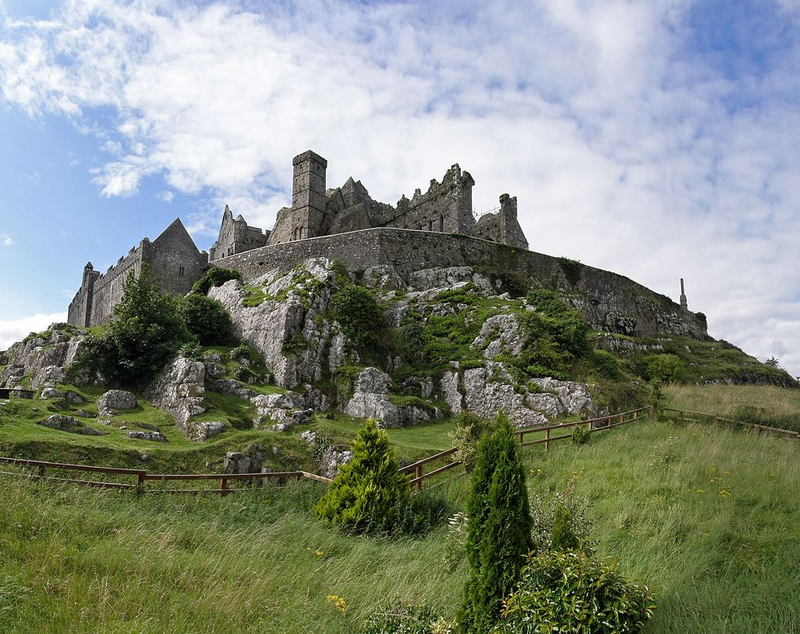 Cashel Rock-the traditional seat of the kings of Munster prior to the Norman invasion. It had the most remarkable collection of Celtic art and medieval architecture and what was left of the castle (below). Cobh-the last port of the Titanic and a seaport town. Also had a memorial to the Titanic and the Lusitania. Cathedral Church of St. Colman-a Roman Catholic cathedral in Cobh with a fabulous interior and exterior. We then boarded a ferry for the short ride to the town of Crosshaven, the location of the oldest yacht club in the world. It started in 1720. 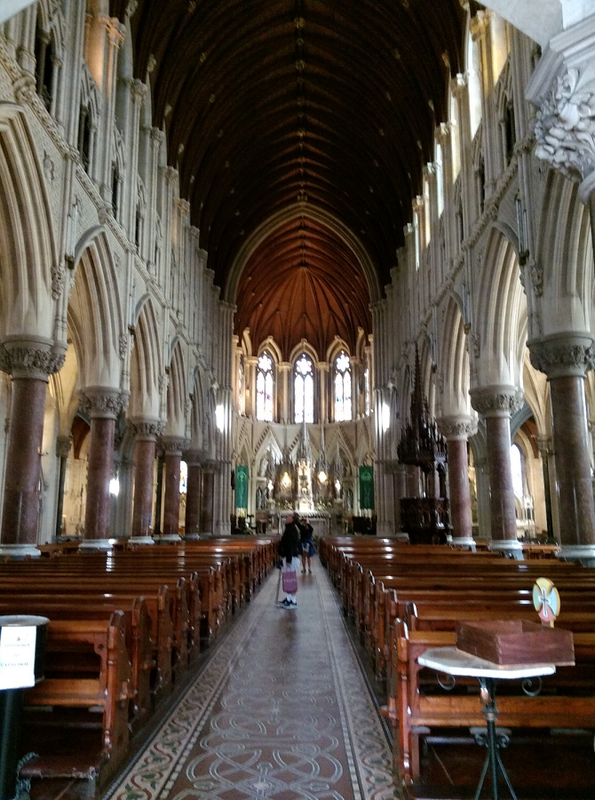 St. Mary’s Cathedral-one of the finest Gothic Revival churches of the nineteenth century in Ireland. Its stone is brown and gray. The field is on the original settlement of Killarney. We returned to our hotel for a nightcap while sitting before an open fire. We followed our usual routine of my reading and looking at the stock market and BJ’s watching TV and what was happening in the world before hitting the sack. 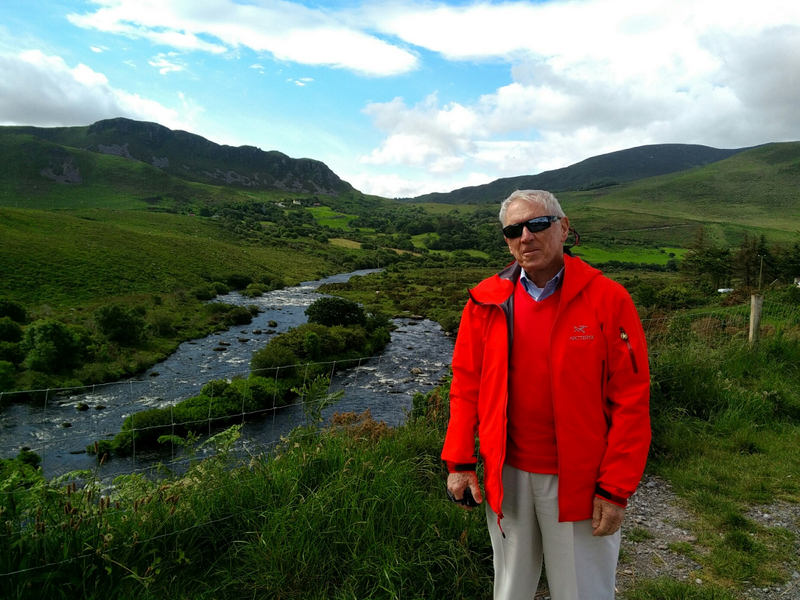 6/14 Jim picked us up and we started our travel through the sights of the “Ring of Kerry.” We visited an old village that showed bog farming, heating with peat, small ponies, a gypsy caravan, and the homes of the inhabitants of the time. The homes had thatched roofs. 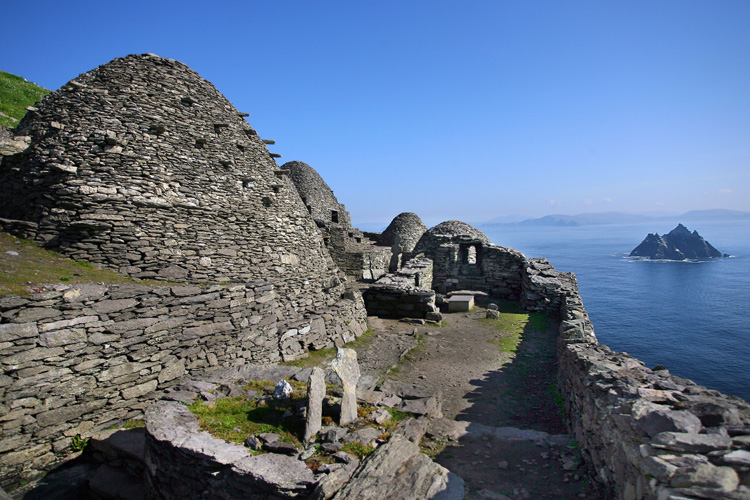 The larger island, Skellig Michael is the site of a sixth century ruin. As a point of interest to Star Wars fans, the final scene of The Force Awakens was shot here in July 2015. The smaller of the two islands is the home of some 30,000 northern gannets. This area was very beautiful based upon the geography of the valley, mountains, hills, water, rocks, and the rural character of the area. We went to dinner at the Italian Kitchen. We then read and watched the very sad events taking place in England. 6/15 We had breakfast (all of the places we stayed provided complimentary, full breakfasts), finished packing, and waited for Jim. The drive to Adare, in County Limerick is billed as the pettiest village in Ireland. Between the thatched roofs and cute stores, we found it very attractive. It seems that certain surnames are very common in the different villages and our guide mentioned this in all of the smaller places we visited. 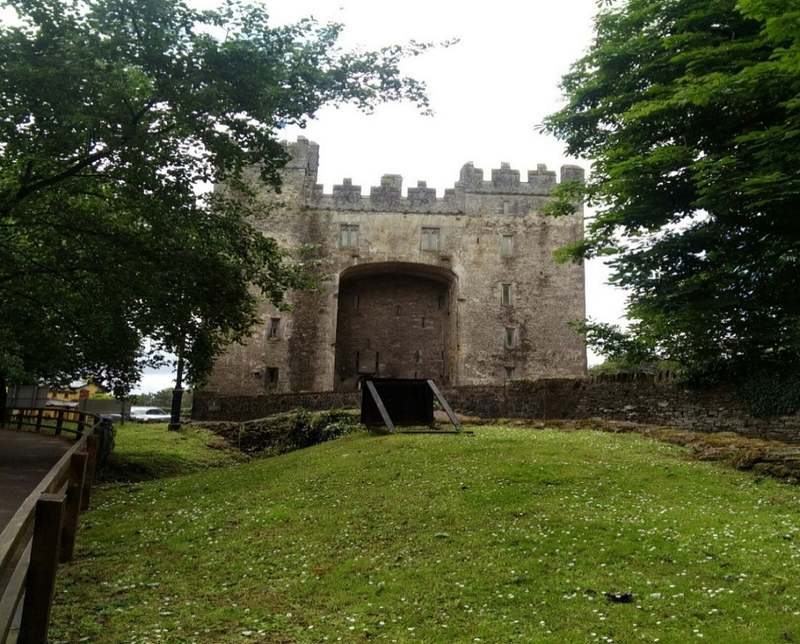 Bunratty Castle (above) and village-the fourth and present castle on the site was built by the MacNamara family around 1425. It went through many owners and is now restored through the Office of Public Works. It is open to the public and there are on display: sporting furniture, tapestries, and works of art that date from around 1600. 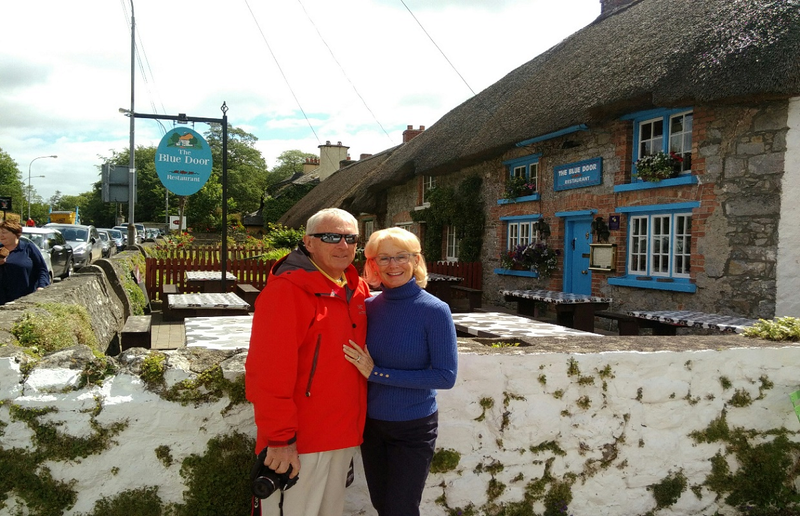 We were then off to Kilrush, a coastal town in County Clare that we drove through. It has existed since the sixteenth century. Today, there is a 120-boat marina with a lock gate and access to the Shannon Estuary and the Atlantic Ocean. It is the home of the Royal Western Yacht Club of Ireland established in 1827. We next passed through the small coastal town of Kilkee. It is a popular seaside resort and has been since the early 1800’s. 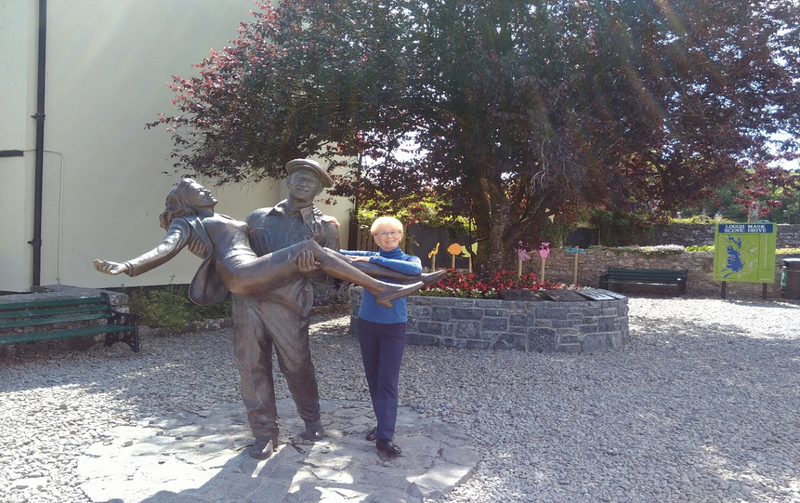 After this, we drove through the farming community of Doonbeg and wandered through the Trump International Golf Links and Hotel.Next up was Quilty, a small fishing village before coming to Lahinch and our hotel, the Vaughan Lodge for a stay of two nights. The exterior is nothing to look at. However, the friendliness of the staff and the food made up for this. Our room was nice. We experienced a long and beautiful day. After dinner at the hotel, we retired and read before hitting the sack to the sound of a howling wind. 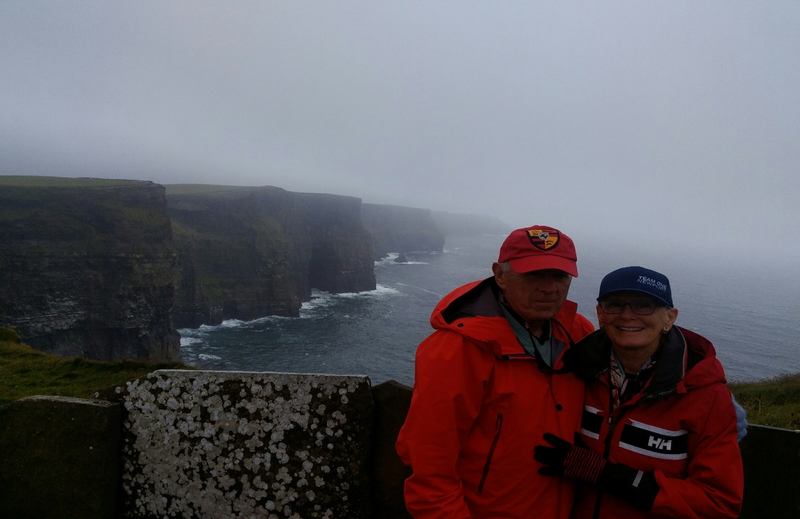 Cliffs of Moher through the Burren region (there are no trees in this area), the mile-upon-mile of unbroken limestone, sandstone, mudstone, and siltstone rock that seems solid and runs down to the road. If exploring this odd landscape, it is highly recommended that one uses a local and knowledgeable guide due to sinkholes and caves. The cliffs rise 390 feet above the Atlantic at Hag’s Head and to the north rise to 702 feet. We walked up to the tower for photos although the fog and wet weather were a bit dampening on activities. We are now headed to Aillwee Cave that consists of over a kilometer of cave trail that we trekked inside of the mountain. The public is not allowed to go all the way due to the low height of the walls. There was also an underground river. The lighting went on as we approached and off as we passed. 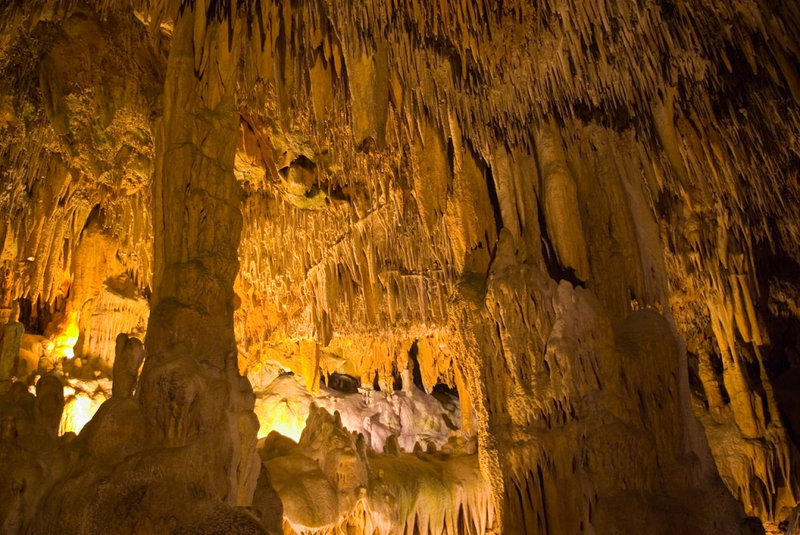 There are calcite deposits but nothing as in Luray Caverns in the US. This cave was discovered by a farmer, Jack McGann in 1944 when chasing his dog who was following a rabbit. He waited until 1973 to let cavers know of its existence. We understood that after a number of drinks that this was revealed to the cavers in a local pub. We then returned to our hotel and read until time for a light supper. 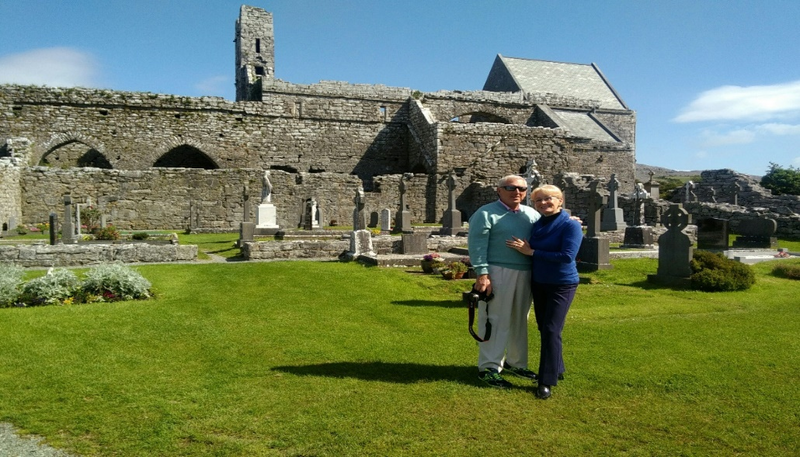 Corcomroe Abbey-a 13th century Cistercian monastery located a few miles east of the village of Ballyvaughan. The ruins feature stone carvings and the tomb of an Irish chieftain, Conor O’Brien, King of Thomond. We are now on our way to Galway in western Ireland. Residents refer to themselves as “Glaswegians.” During the 16th and 17th centuries, Galway remained loyal to the English crown. In 1642, the City allied itself with the Catholic Confederation. During Cromwell’s occupation, it allied itself with the Jacobite cause. The great families of the time were ruined and then came the potato famines of 1845-1852. Glasgow did not recover until the late twentieth century. 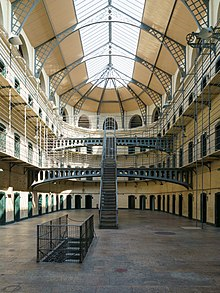 This later period was referred to as the Celtic Tiger and was due to the infusion of foreign investment and development. After this, Ireland once again fell into recession; came back out due to more free education, then fell into recession in 2008. It has been slowly recovering. 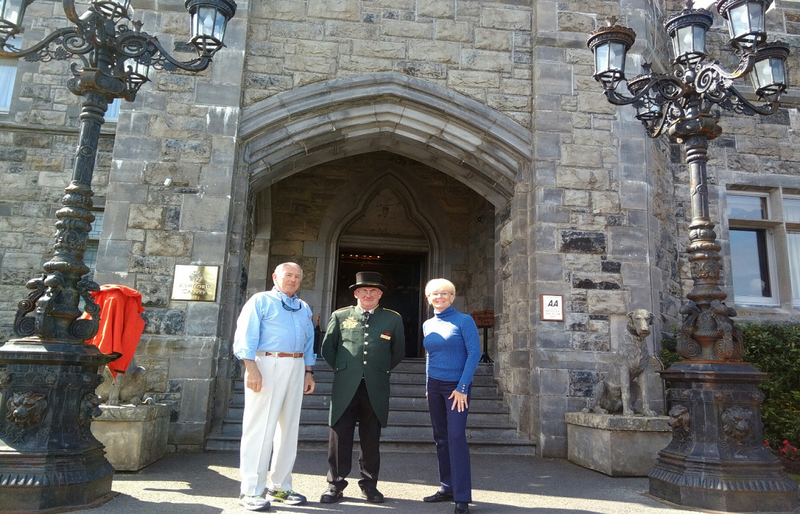 Ashford Castle in Cong-a medieval castle that has been turned into a luxury, five-star+ hotel on the shores of Lough (lake) Corrib. This was previously a home owned by the Guinness family. We know that they were into more than beer and are now owned by Diageo. The first Guinness, Arthur had a 99-year lease on the property in Dublin in the 1700’s. 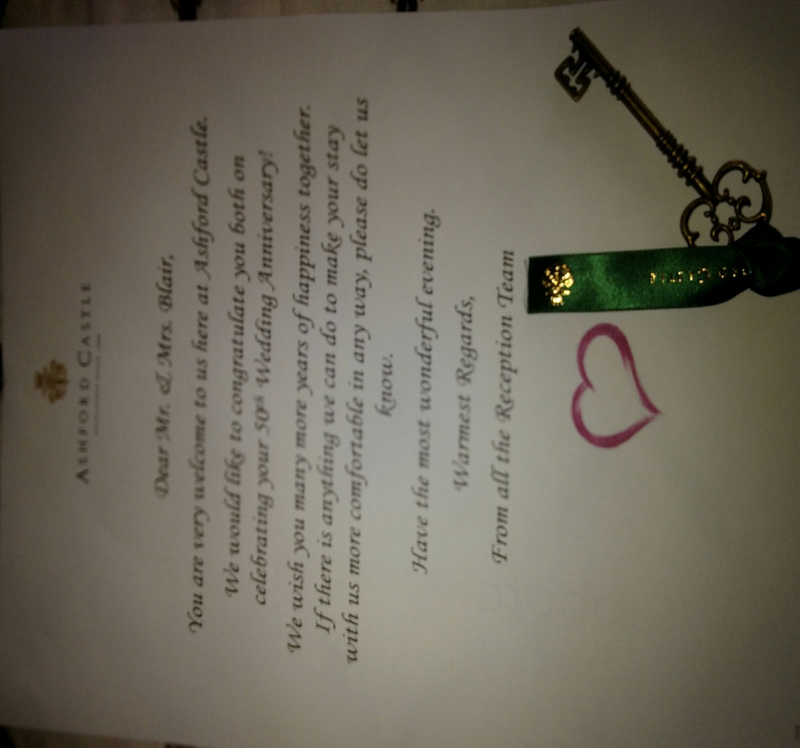 The castle has played host to many famous people and is considered the number one hotel in IrelandAs an aside, our room was not ready when we arrived so they settled us in the bar and fed us complementary drinks and chocolate. We were then fetched and escorted to a beautiful room with a water view. ! We watched “The Quiet Man” with John Wayne and Maureen O’Hara and directed by Academy Award winner John Ford and shot locally. Due to the acting, it was a trial to get through it. We then walked the beautiful grounds, returned to our room, changed for dinner, and went down to an over-the-top dining experience. We retired early. Just some of the activities of the hotel: golf, tennis, archery, shooting, bicycling, kayaking, falconry, fishing, and a fitness center and spa. 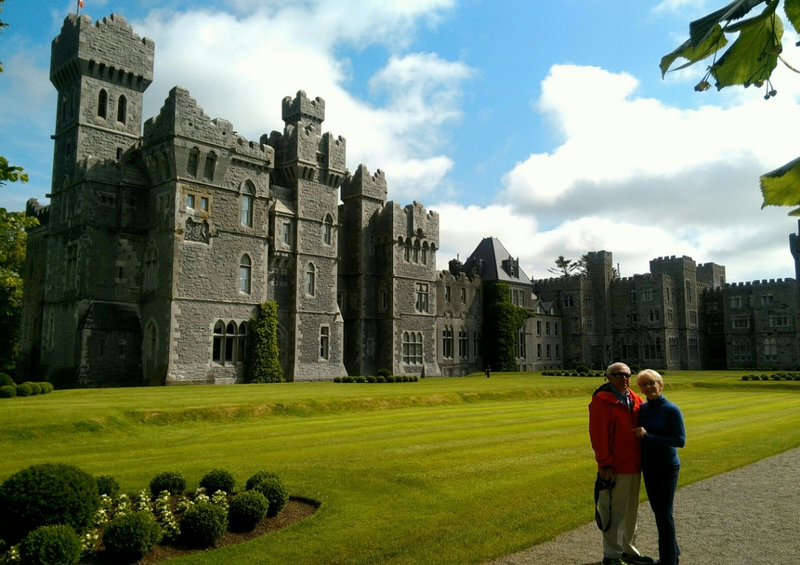 a Benedictine Abbey, a monastery founded in 1920 on the grounds of Kylemore Castle in County Galway. It was founded by Benedictine Nuns who fled Belgium during WW l. The original building was for the Henry family, a wealthy London doctor. Construction began in 1867 and took four years and one hundred men to complete. After the doctor returned to London in 1909, it was sold to the Duke and Duchess of Manchester. Unfortunately, the Duke was forced to sell the castle due to gambling debts. The nuns purchased the castle and lands and started a school for Catholic for local and international girls. It was forced to close in 2010. 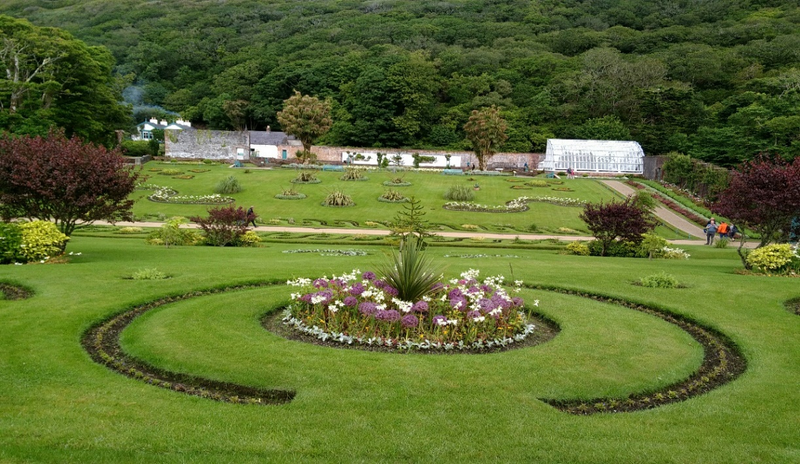 The gardens have been open to the public since the 1970’s. 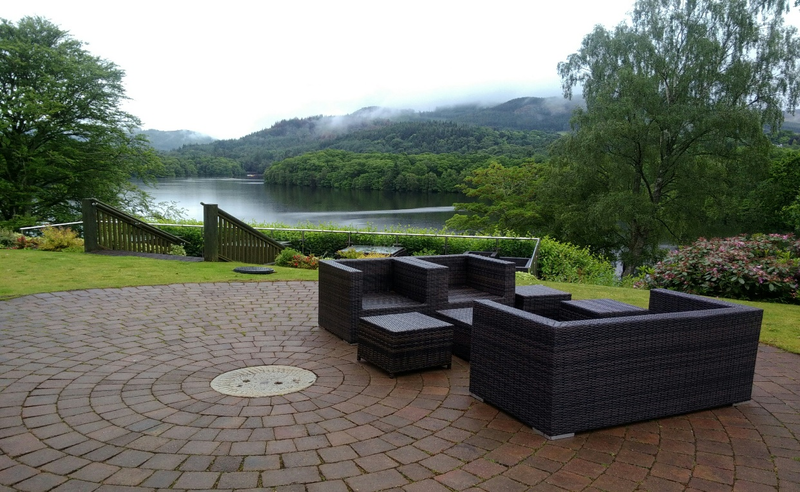 The setting is wonderful with hills to the back and water to the front. We then drove to Leenane where we viewed a fjord that runs out to the Atlantic. This is one of three fjords in Ireland. We arrived just in time to walk to the Falcon Center for our “walk.” For one and one-half hours, we learned about the birds, their habits, hunting abilities, and individual characteristics. We also learned to “fly” them. Mine was 3.5 pounds and BJ’s was 1.5 pounds. You wear a thick leather glove that covers just below the elbow, take an underhand throw and let the bird go into the air. They use your arm as a branch and when you see them upon their return to your arm, you note that the branch they were on dips slightly upon takeoff. The falconer put a piece of chicken in the glove and the bird returns. The females are generally more dominant and heavier. We once again walked the property then went into the hotel’s lunch room for a late, light bite. After this, we then did an in-depth tour of the interior of the building, and decided to retire and read. We also watched a movie. 6/19 We arose to a pleasant surprise; the sun was peeking through. After a large breakfast, we returned to our room, packed, went for a walk and a photo shoot. We then drove back to Dublin and stayed at the Dunboyne Castle. I have never seen anything that more resembled a roadside hotel with the name, “castle.” The A/C in our room did not work. They sent up a maintenance man who could not fix the problem and by this time, the room was over 90 degrees. I called and finally they sent someone up who transferred us to another room. We went down to the restaurant where the A/C was not working so we sat outside, ordered a pizza, and that was dinner. The only “poor” spot in our whole trip! 6/20 Jim picked us up at 6 AM for our drop-off at Dublin airport. Unfortunately, as we were getting set to board, the board with the flight times lit up with all flights showing as delayed into the New York area. We read and finally boarded. We arrived home four hours late. We found the service on British Air better than any of the US airlines. Our limo dropped us off in CT and another trip ended on a good note. A wonderful way to celebrate 50 years of being happily married!